For the 3rd time the Spanish Federation of Underwater Activities (FEDAS) through its member, the Baleares Federation organized the Junior Finswimming World Championship in Palma de Mallorca. Earlier the Beleares federation has already organized two successful competitions, the SA POBLA European Championships in 1987, and the 2000 Finswimming World Championships in San Hugo – Palma. The young athletes of the CMAS member federations found themselves once again in the beautiful swimming pool of SAN HUGO. Participation was good, 23 countries and more than 200 swimmers were present to fight for the 30 titles in pool and the 4 in the sea, long distance, during the five days of competitions. Many juniors records were broken and even the world record on the 200 meter ladies’ bi fins was given to the past. In overall ranking Russia came first, followed by Colombia and Ukraine. All in all, the medals were distributed among 13 countries, Russia and Colombia taking 9-9 gold medals. It is believed, that Colombia achieved this magnificent result already as a run-up for the 2011 II. CMAS World Games to be held in Neiva and the Isle of San Andres – Colombia. 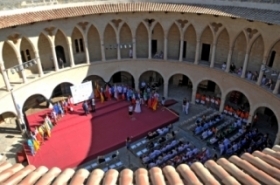 Both, the Spanish/Baleares Federations and the Government of the Baleares were excellent hosts to the Championship.